We had hoped this one would be so close that a point kicking competition would be required to separate the teams but the game was anything but close in the end. Westmeath were far too strong for John Sugrue’s experimental Laois side as a hat-trick from corner forward Callum McCormack led them to a nine point win in Stradbally this afternoon. The Laois team showed 15 changes to the side which lost out by a point last week and one of them, veteran Ross Munnelly, began the scoring in the first minute. 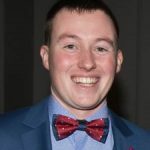 The O’Moore men almost had a goal when Eoin Lowry raced clear and unleashed a thunderbolt which came back off the underside of the bar and eventually fell to Munnelly who began his sixteenth season by raising a white flag. 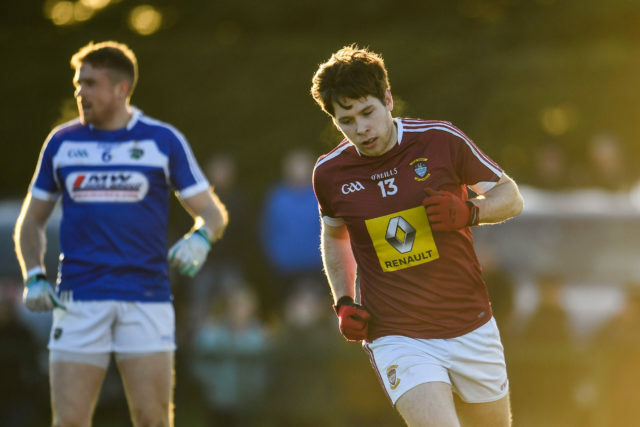 But Westmeath, who made just two changes to their team that enjoyed victory eight days ago, took the lead by the fourth minute thanks to Kieran Martin and Callum McCormack. McCormack, who gave St Joseph’s corner back James Kelly a torrid time, then had the ball in the net for the first time after winning a high ball and rounding the defender to score. Eoin Lowry, who was Laois’s brightest spark in the first half, replied with a free, but it would be 14 minutes before Laois would score again. In that time, Westmeath stretched their advantage to seven points with Luke Loughlin, John Egan, Martin and McCormack all raising white flags. Laois did stage a bit of a rally though by the 27th minute as, thanks to a brace from Lowry and another from Munnelly, they reduced the gap to four points. But Westmeath kicked on again as centre forward Loughlin once again added two more while Callum McCormack took his first half tally to 1-3. Ross Munnelly converted a close range free on the half time whistle which left Laois trailing by 1-9 to 0-6 at half time. Laois were six points down at half time in Mullingar last week and came back but there wouldn’t be a repeat here as points from Loughlin, Martin and substitute Alex Gardiner extended the margin to nine on the resumption. But Laois enjoyed their best period of the game after that. Only a Luke Loughlin point broke up the Laois scoring as Lowry, Munnelly, Niall Donoher and substitute Ronan Murray all split the posts to make it 1-13 to 0-11 as we entered the final quarter of the game. But two goals in two minutes would end this game as a contest. A high ball caused pandemonium in the Laois full back line and James Dolan won the ball before laying it off to Callum McCormack for his second goal. Aaron Forbes replied with a fisted effort for Laois but Westmeath came forward again and, following a strong run by Kieran Martin, McCormack was on hand to complete his hat-trick. Luke Loughlin kicked two more Westmeath points and although Laois did raise a green flag when Ross Munnelly shot low after a brilliant run by Eoin Lowry, their race was well and truly run. A late Conor Slevin free left nine in it at the end as Westmeath advance to face neighbours Offaly in the semi final.